Indeed, I've always been a big fan of this suite, my biggest dissapointment was that it was never made in blue, hence the only skin that remains in day to day use from this great set is the BoxIP one, but I digress... 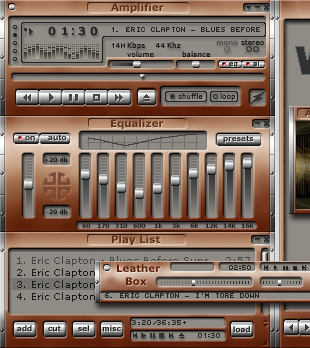 The Winamp incarnation is probably one of the best of its kind out there. Not only is it highly original, but It's aesthetic, pleasing to the eye and perfect for day to day use. A must download for everyone. It is Fantastic! Almost perfect! Come on, treetog, make it in blue or aqua. Seems like the downloadlink is broken, no pic nor download. Great choice in colors. not to dark.